SCE offers a full line of cleanroom-safe polypropylene chemical transport carts for today's most demanding manufacturing and laboratory environments. Every SCE product stands up to the most stringent cleanroom / safety requirements. Now you can have years of clean, safe transport of your hazardous acid / corrosive chemicals and materials with out the rusting due to metal construction or the delaminating of wood core products. Polypropylene is the material of choice for acid and corrosive chemical transport carts. 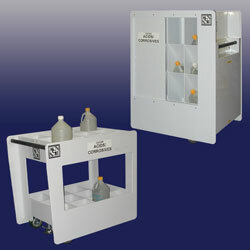 All SCE acid carts / corrosive carts are constructed using liquid tight welding techniques, have ergonomic designs, spill containment, modular bottle dividers or drum rollers and cleanroom quality wheel / caster assemblies (standard features). The Econocarts provide an economical solution for safe acid / corrosive chemical transport. These carts include all the SCE standard features. 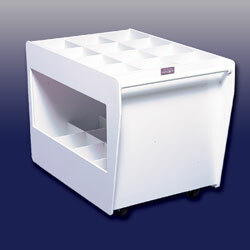 Consider the optional floor brake to improve the safe use of the Econocarts. The UFC Code Compliant carts offer all the features to meet the stringent safety standards of the Uniform Fire Codes and the most critical cleanrooms (both semiconductor and biomedical). Standard features include Top or Side Loading designs, auto dead-man braking system, integral spill plenum with drain valve and hose, hinged or sliding doors to fully enclose the chemicals within the cart, recessed wheel assemblies for cleanroom operation, modular bottle dividers or rollers for drums, plus all external edges are routed smooth to minimize particle generation. Options include - FM4910 approved polypropylene materials, Ultra-clean wheels / caster assemblies and custom designs / sizes to meet any requirement.